Nina by Nina Ricci was my first perfume. At the time, I was still growing out of my body mist and lotion phase and was still wearing fruity fragrances. That was four years ago, before I gave florals, musks, woods, ambers, and all manner of things a try. 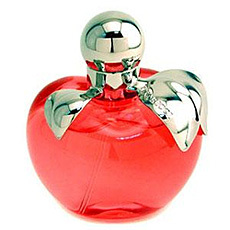 Nina is a young fragrance, filled with apples and sweetness and sugary sparkle. I remember when it was new, when I had wandered into the perfume section by accident and thought the bottle was just adorable. In Bottle: Vibrant lemon and lime with a note of apple and sugar. Nina prior to application smells like a lemonade stand. A lemonade stand with a very popular, very aromatic product though. Smell a couple more times and I start to notice this sticky, sweet vanilla toffee too. Applied: Lemonade followed by the apple note. The apple in Nina is a big, red juicy one that’s been covered in a vanilla toffee mixture. There’s a lot of sweet notes in this fragrance but thankfully that lemonade and lime scent at the beginning doesn’t fade immediately. It sticks around and adds a tartness to Nina so that the sweetness of the fragrance doesn’t turn cloying. There’s a bit of taming going on too from the very light florals as Nina settles down into a fresh scent reminiscent of a cool, refreshing drink. The dry down takes a while to approach because Nina has excellent longevity. Hours after application and the citrus notes fade first, with the apple and sugar holding on strong until those too start to give. It’s on the very last leg of the fragrance’s stages where some of the wood notes show up for a very brief time before completely disappearing. Extra: Nina Ricci was founded by Maria Ricci and her son in 1932. They started out as a fashion house in Paris. The Nina Ricci brand’s best known fragrance is L’Air du Temps. Design: Contained in an adorable apple shaped bottle, Nina has a metal cap that protects the sprayer that is also used as the apple’s stem. The leaves have the house’s name engraved into them and the entire bottle is one seamless, beautiful piece of fun decorative art. Even if you don’t like the fragrance for some reason, the bottle makes for very cute decor. As noted in an earlier review, the makers of the Twilight perfume used Nina’s bottle for their fragrance, sparking a lawsuit. Notes: Lemon, lime, apple, toffee, peony, moonflower, vanilla, cedar, applewood. I don’t wear Nina much anymore. Sure, once in a while I’ll dig it out and give it a sniff, maybe a spritz, but I’ve since moved on. Moved on but not forgotten. I wouldn’t get rid of Nina. It was my first real perfume, a stepping stone into the rest of my obsession. To get rid of my first bottle of perfume just wouldn’t make sense to me. Reviewed in This Post: Nina, 2007, Eau de Toilette. This entry was posted in fruity, nina ricci, Reviews By House, sweet and tagged apple, bottle, copy, du, fresh, lair, lemon, lemonade, lime, nina, refreshing, ricci, robert, temps, twilight. Bookmark the permalink.